A Natuzzi Editions masterpiece off the floor model with chrome feet. The sofa gives a floating impression. Amazing modern sofa with power recliner on one end with power headrest and chaise on corner end. 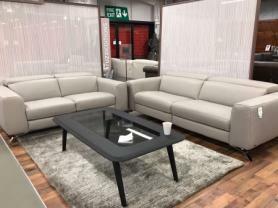 Upholstered in beautiful grey/stone Italian high grade protecta leather. Currently out of stock - New stock expected mid April. Approximate Measurments: 285 cm x 240 cm Depth: 105 cm.